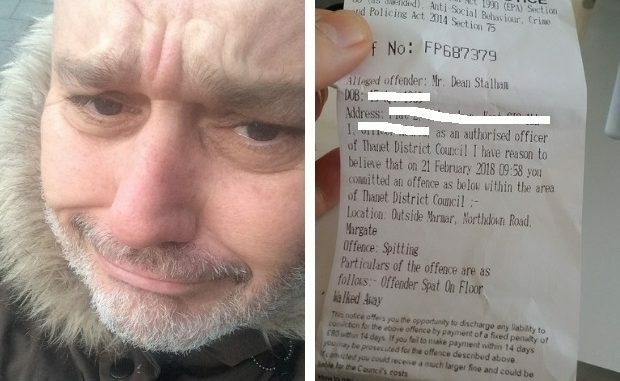 A Margate gallery manager, writer and artist is vowing to fight his case in court after being slapped with a penalty notice for spitting. Dean Stalham, who runs the The Stretch Outsider Arts Gallery in The Centre, denies the offence and refuses to cough up the £80 fine, saying he was simply choking on a bit of bacon. The dad-of-five, who lives in Cliftonville, has been protesting his innocence since being issued with the penalty notice almost a year ago and says he will now take his chances in court. In the letter the solicitor says: “Mr Stalham had consumed some bacon in the Dalby Café and emerged from that establishment just prior to the commission of the alleged offence. He wished to clear his throat, not in the manner of an expectoration, but a short, sharp cough. There was no intent to gather any spittle or spray same upon the pavement or anywhere else. “To his surprise, a minuscule morsel of bacon flew from his mouth, and did not even land on the pavement. It ended up on his sleeve. “We respectfully state that the offence of spitting is not made out in this case. Mr Stalham, an artist and writer of high repute, and champion of many charitable causes, is not prone to acts of littering or any anti social behaviour, and will not be paying this fine. The case has now ended up in court with an initial hearing taking place at Canterbury Magistrates this morning (January 22). It has been adjourned for trial at Folkestone Magistrates Court on March 25. From the three months July-September last year Thanet council’s Enforcement Team issued more than 1,800 litter fixed penalty notices and carried out over 1,300 enforcement actions. Enforcement is carried out via a contract with Kingdom services. Non payment of a Fixed Penalty Notice results in legal action. The maximum penalty which can be imposed by the courts for littering is £2,500. Those litter enforcement officers working for Kingdom are an absolute menace on the streets. Picking on people who haven’t done anything but walking past bags of waste thrown out on the pavements or not collected by the Refuse Collections. As there are very few Road Sweepers left in Thanet how about TDC employing these guys to pick it up instead of chasing innocent people up and down the streets. The money would be better spent ! What happens if you refuse to give them your details & just walk off? They have zero powers to detain you or arrest you, they can call the local cop shop-but by the time they get there, if they don’t have more pressing matters than a bit of saliva or fag end on the floor to attend to urgently the person would be long gone. Bloody good idea. Most of the time they are doing nothing so give them a black bag and let them do something useful. GDPR leak in photo of enforncement ticket. Name, Address and DOB? Not really a leak as he gave us the ticket but yes, now blanked out. Personal information still disclosed that you were in possession of. Disclosed to us by the person, his age and the street of his address would generally be in an article anyway. I assume a mobile phone full date of birth and full address rather than street name only would never be published in an article? That was the information on the ticket. Candidate for someone to use for fraudulent purposes? Any information released to unauthorised people that can identify a person is classed as a GDPR breach. Is this a joke? Thanet’s streets are covered in dog crap, left behind building material, fag ends, piles of rubbish/fly-ripped waste, vomit etc for which rarely if ever are fines issued & people are being fined for spitting? Will we also be told just how much this nonsense has thus far cost TDC-namely the taxpayers in legal costs & correspondence? One would wager a lot more than 80 quid. It’s no joke – you should have seen there faces- couldn’t believe I was going not guilty – clerk said- ‘on what basis are you pleading not guilty? ‘Err – that it never happened’ she replied ‘well as long as you realise it will be down to the Judge who is believed and who is not’ – British law? So complex isn’t it? One will be deemed telling the truth- the other will be deemed a liar. I’m sure it’s just a piece of elaborate performance art ..